Instituted in 1940 to recognise acts of great gallantry primarily on the home front which did not qualify for Military honours. The Cross was named after King George VI and is awarded to Military and civilians alike for gallantry of the highest level. 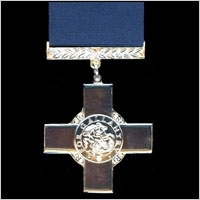 It was awarded to the island of Malta to recognise its gallantry during WWII and awarded collectively to the Royal Ulster Constabulary in 2000. HM the Queen presented it at Hillsborogh Castle in April 2000. Equivalent in rank to the VC, the GC is awarded to Military personnel for gallantry "not in the face of an enemy"
The latest award was to Lieutenant, now Captain, Samuel Shephard of the Royal Marines for attempting to save the life of a fellow RM Officer in a training exercise off the coast of Egypt. This is die-struck in the same manner as the original awards. Produced by the Company who are the approved suppliers of the original George Cross to The Central Chancery of The Orders of Knighthood.